Flats above shops in the borough are receiving a waste and recycling service for the first time. The first collections started last week and featured a purple sack for rubbish and a clear one for recycling. Cllr Ellar added: “This new service is the latest in our drive to increase the recycling rate in Hounslow. 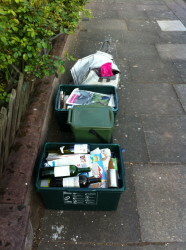 “Recycling is good for the environment and council taxpayers too. Last year, thanks to our residents’ efforts, we saved over £2million on landfill tax fees and we want to top that this year.